This dual-language (Latin and English) edition offers an English translation of the text of Virgil's Aeneid, Book 4 (the story of Dido and Aeneas, probably the most widely read book), with a translation of Servius' celebrated commentary below. On facing pages are the original, unadapted Latin texts of Vergil and Servius, allowing easy access to Servius' seminal work. This edition is an unparalleled tool for both scholars and teachers, and the ideal complement for any in-depth study of the Aeneid. At first sight, it might seem pointless to provide a translation of a part of Servius for those with no Latin. However, such is the care and ingenuity shown by three scholars working together that the implausible has become fascinating. Servius’ Commentary on Book Four of Virgil’s Aeneid starts with an informative introduction on what we know of Servius and his commentary followed by a statement on methodology. The main body of the work consists of a text of Aeneid 4 as known to Servius in the top half of the left hand page faced on the top half of the right hand page by an English translation (‘an ugly crutch to our readers’). Beneath Virgil’s text is to be found Servius’ and, beneath the translation of Virgil, a translation of Servius: ‘so that the reader has. . .all four texts available at once.’ The work was very popular indeed in the middle ages but much neglected since, with the result that any editor now must examine a vast host of hitherto poorly reported manuscripts before seeking to judge what modern resources are available; by ‘modern’, I mean anything published since 1800. One of the many controversies that have been aroused over the years is the question of how or whether various manuscripts are related to one another. Reeve has given much thought to this question and has accordingly allowed himself to cite in his apparatus reconstructed readings. No doubt, as he himself predicts, some will complain but no one should be deceived and the practice does make for some clarity and brevity in an apparatus which is still very full indeed. Others, or perhaps many of the same, will lament the substitution of English for Latin in the title page and introduction, though not on the dust cover or apparatus. Whatever view one takes on this point, it is probably the case that of those non-native speakers of English likely to be interested in this text, most would be more comfortable with Latin than with English. 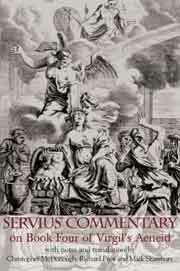 Servius' Commentary On Book Four Of Virgil's Aeneid Christopher M. McDonough, et al. Bolchazy-Carducci Publishers 1000 Brown Street, Unit 101, Wauconda, IL 60084 0865165149 $29.00 www.bolchazy.com The collaborative academic effort of Christopher M. McDonough, Richard E. Prior and Mark Stansbury, Servius' Commentary On Book Four Of Virgil's Aeneid is an impressively annotated translation that presents the classic and widely read book four of Aeneid (the story of Dido and Aeneas) in English translation along with a translation of Servius' own detailed and renowned commentary. On the facing pages are the original Latin text and commentary. Notes further illuminate this excellent presentation for both classical literature and Latin language students.